Join us for this one-day intensive exploring wonder and awe. All Sacred Journeying workshops and intensives are experiential programs for men and women seeking greater awareness, joyful expression, and longing for a deeper relationship with themselves and the world through mindfulness practices, gentle movement (QiGong), guided imagery, shamanic journeying, journaling, and connection to the natural world within a circle of heartful seekers. Please bring a light lunch, metal or glass container for water (water and tea will be provided), journal and pen, and comfortable clothes for indoor gatherings and a gentle hike. Please also bring a small and meaningful object for our altar (photo, jewelry, feather) that you will take home at the end of the workshop. Registration: Pre-registration required. Space is limited! 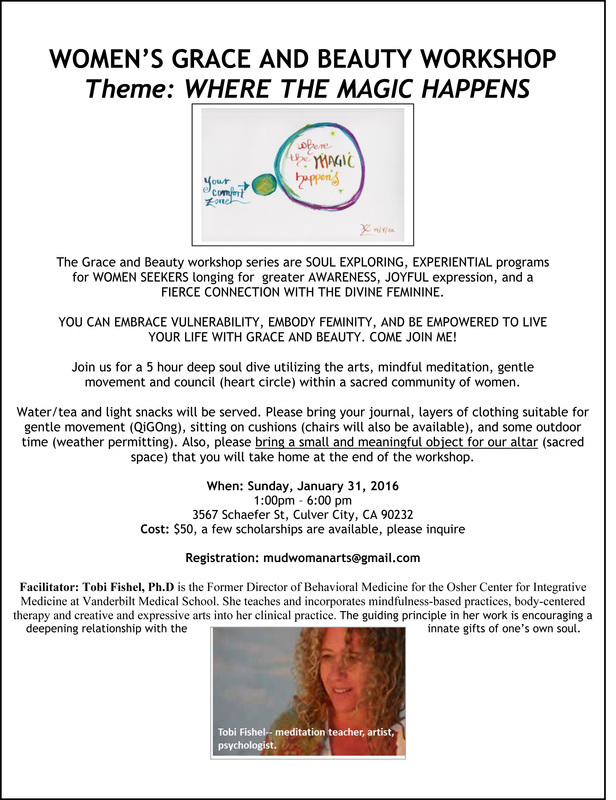 Email Tobi Fishel at mudwomanarts@gmail.com with questions or to register. Tobi Fishel, Ph.D. has a spirit-led mind-body clinical psychology practice. Marc Weigensberg, M.D. is an integrative mind-body practitioner. Together, they bring creative arts, ceremony and ritual, music, mindfulness, guided imagery, sitting in council (heart circle) and the love of the natural world to their work. WHAT: Celebrate your wild, wonderful, crazy brave self within a mindfulness and creative writing intensive. We dare you to explore your fiery depths! Join us for an extraordinary day of science, sound, music, and mindfulness presented by a nationally renowned integrative health psychologist, a master Himalayan singing bowl artist, mindful toning vocalist and mindfulness facilitator, African drumming facilitator, and an intercultural improvisation group. This is a hands-on experience that reveals the healing nature of sound and music. Find your rhythm! fee: This is a pay-what-you-can event. Proceeds will support programs such as this one. $45 suggested fee for general admission. To pay $35, please use the promo code GOOD35. To pay $25, please use the promo code GOOD25. To pay $20, for UCLA Faculty & Staff only, please use the promo code GOOD20. To pay $10 (for Students), please use the promo code GOOD10. First 20 students to register (from UCLA or USC) will be admitted free, using the promo code GOODDOE. Advance registration guarantees admission; otherwise, seating will be on a first-come, first-served basis. WHAT: Celebrate your hot summer self with Crazy Brave, a mindfulness and creative writing intensive. We dare you to explore your fiery depths! What: For thousands of years, we have had a deep relationship with the earth and the plants around us. We have known how to harvest and cook so that food and plants were medicine. Come reclaim this wisdom through an evening of preparing, tasting, and taking home some natural and organic remedies for the home. The Grace and Beauty immersions are soul exploring, experiential programs for women seeking greater awareness, joyful expression, and a longing to develop a kinder and fierce relationship to themselves and others utilizing expressive arts, mindful meditation, music, and gentle movement within a heartful community of women. During this special one day retreat, held in Topanga Canyon, just outside of Santa Monica, California, we will gather for rest, rejuvenation, play, and a deep dive into reviving our passion for life as we are held by the beautiful trees, wide open spaces, and a soundscape of birds and silence. Please bring a light lunch, non-plastic water bottle, layers of clothing suitable for gentle movement (QiGong), sitting on back jacks or chairs, and time on the land. Also, please bring a small and meaningful object for our altar (sacred space) that you will take home at the end of the workshop. WHAT: Due to popular demand, we are offering this workshop twice a year! Join Tobi and Merrill for a workshop exploring how crazy brave you are through breathwork, meditation, movement and creative writing. AND BE YOUR CRAZY BRAVE SELF! Samueli Institute is hosting it's 14th annual Women's Wellness Day. Come Join Dr. Fishel for Spirituality and Health: Nurturing your True Self for Health, Happiness, and Harmony. May 13, 2016. Herbs and Botanicals & much more! – Derek Walcott, from "Love after Love"
Learn eight ways to nurture yourself with this new, experiential workshop for anyone interested in cultivating their own true hunger. Using mindfulness and creative arts-based exercises as our guide, we will explore where we want to go in our lives, clarify what our own individual obstacles are, and the many resources that are right within our reach. Learn mindfulness skills (including mindful eating) to deepen our awareness, and nurture compassion for our relationships with ourselves, our bodies, and others. Increase capacity for joy and move beyond obstacles that impede our living our most authentic life. Learn about the seven-hungers model from renowned pediatrician and mindfulness expert, Dr. Jan Chozen Bays, and what mindfulness practices can satisfy each of them. Practice new ways to celebrate life, love, and the strength of your own true hunger through creative play and heart council. From noon to 1 pm, we will eat together and practice helpful mindful eating skills. Please bring a bag lunch. Continuing Education credits for LCSWs, MFTs, and RNs can be requested during the registration process for an additional $20. Contact UCLA Healing Arts program for information. What: In the old days, dreams were teachers. Dreams taught us ethical living. Learn how we swim together in the river and can be connected in dream time. Learn how we can listen to the lessons of our dreaming world from psychological, spiritual, and community perspectives. 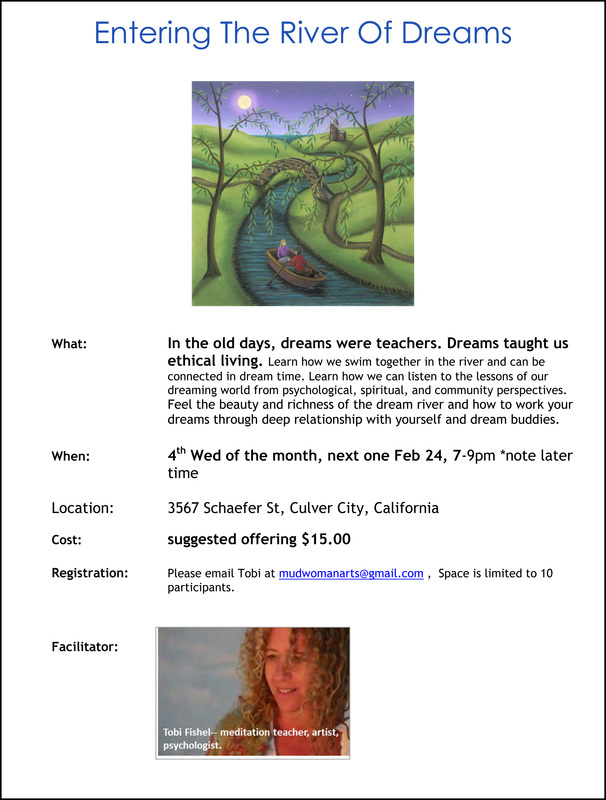 Feel the beauty and richness of the dream river and how to work your dreams through deep relationship with yourself and dream buddies. 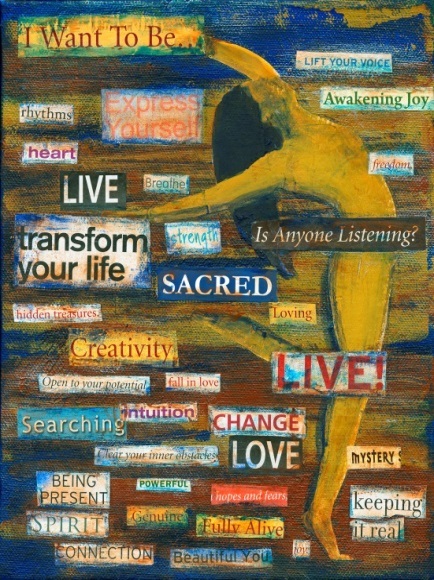 What: Would you like to be more connected to your own inner wisdom, your own voice, your own inner strength, your inner playful self? 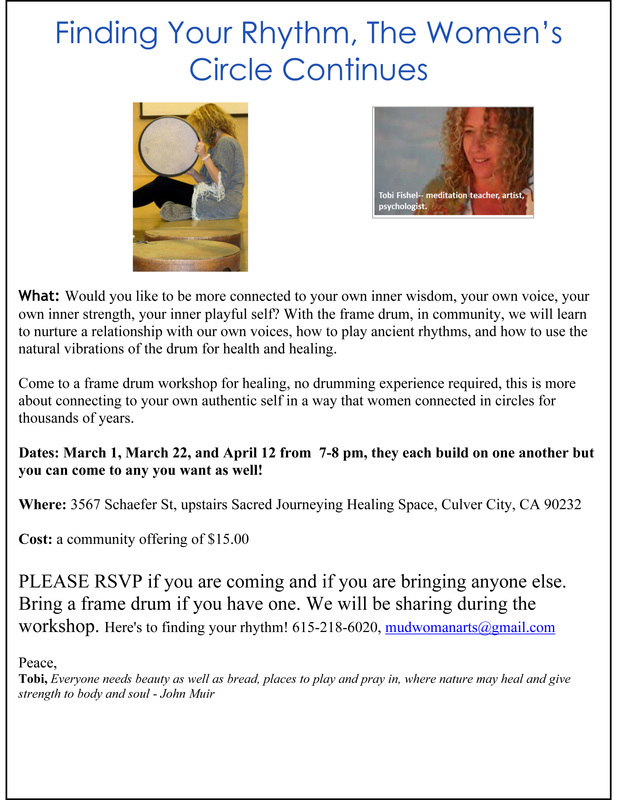 With the frame drum, in community, we will learn to nurture a relationship with our own voices, how to play ancient rhythms, and how to use the natural vibrations of the drum for health and healing. about connecting to your own authentic self in a way that women connected in circles for thousands of years. Dates: March 1, March 22, and April 12 from 7-8 pm, they each build on one another but you can come to any you want as well! PLEASE RSVP if you are coming and if you are bringing anyone else. The Grace and Beauty workshop series are SOUL EXPLORING, EXPERIENTIAL programs for WOMEN SEEKERS longing for greater AWARENESS, JOYFUL expression, and a FIERCE CONNECTION WITH THE DIVINE FEMININE. YOU CAN EMBRACE VULNERABILITY, EMBODY FEMINITY, AND BE EMPOWERED TO LIVE YOUR LIFE WITH GRACE AND BEAUTY. COME JOIN ME! 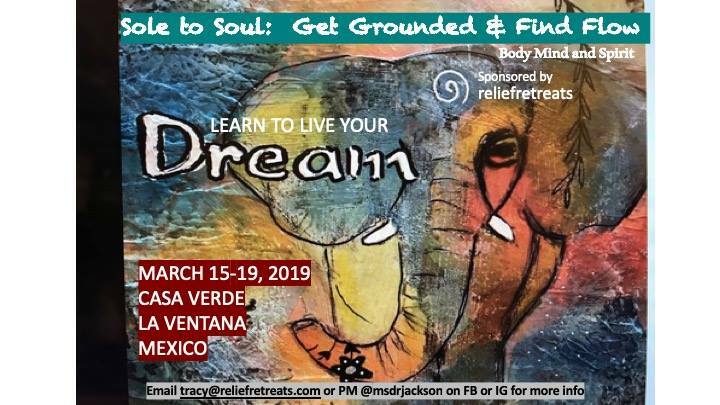 Join us for a 5 hour deep soul dive utilizing the arts, mindful meditation, gentle movement and council (heart circle) within a sacred community of women. Water/tea and light snacks will be served. Please bring your journal, layers of clothing suitable for gentle movement (QiGOng), sitting on cushions (chairs will also be available), and some outdoor time (weather permitting). Also, please bring a small and meaningful object for our altar (sacred space) that you will take home at the end of the workshop.